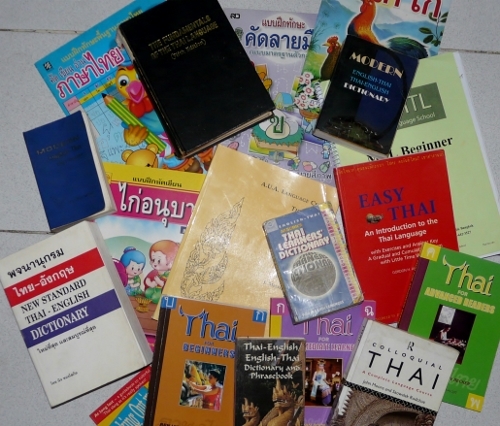 At the back end of last year I decided, after five years of living here, I really should make a proper effort to learn Thai. So I enrolled in a school in Rayong and for two days a week I sat in a class of similarly bemused people. But then the school closed (insufficient number of pupils) and so once again I was just left with my books and CDs and all the on-line resources. The classes had taught me one thing though - I will never learn this language without the discipline to study the school gave me (I paid for a whole year of classes) and without someone to listen and cajole and encourage me (and for all sorts of reasons, Ploy does not fill that role). Most schools are in Bangkok and I didn't fancy being in a large class of people, most of whom were probably sent there by their companies (the Rayong school was only 4-6 people and mostly retired people learning Thai because they wanted to). But I happened upon an on-line school that recruits independent teachers all over Thailand and so I chose (with the school's advice) a teacher from Ayutthaya to continue my lessons. Tomorrow is lesson number 4: I go twice a week for two hours and I am concentrating on pronunciation (my teacher's choice) and reading and writing (my choice). And it is working out rather well - particularly the pronunciation which, because I find it difficult, I have mostly ignored which has led to me having a reasonably wide and varied vocabulary which no Thai, other than Ploy, can understand. As you become more embroiled in the language you begin to have little lights go on in those dark little recesses (and sometimes lights go off too). Sometimes someone steals the bloody lamp. I have noticed that Thai words for animals have a certain descriptive or even onomatopoeic nature, although it is not consistent (at least to a Westerner). For example, the Thai word for 'crow' is 'gaa' which is a reasonable approximation of the bird's call (Ga Ga Ga). The Thai word for 'goat' is 'pae' which is pronounced a little like 'bpaa'. Owl is 'nok hook' (hoo, hoo - I didn't say this was scientific). Butterfly is 'pee seua' which literally means 'ghost shirt' which I think is a rather nice descriptive word for a moth - and the Thai for butterfly and moth are the same. That slightly strange anomaly also applies to rats and mice, which in Thai is the same word despite them being very different animals - 'noo'. That is neither descriptive or onomatopoeic. The word for cow is 'wua' which is little onomatopoeic until you learn the word for pig is 'moo'! Maybe they got them mixed up. Cat is 'mee-ow'. Chicken is 'gai', the first letter of their alphabet which answers the question, which came first, as egg is 'kai'. Except the kilometre is abbreviated to 'kilo' but on the road signs is shown as 'gm', so maybe the egg did come first. But there is one notable discrepancy I have found. Bambi, that shy, sweet little animal that pensively approaches you to eat some berries from your hand, is called in Thai 'gwaang'. Gwaang! Does that conjure up for you this beautiful creature in the way that pee suea might for a silent, ghostly moth, or instead does it sound like something from Adam West's Batman when he is pulverising the Joker. Ker-Pow! Whack! Gwaang!